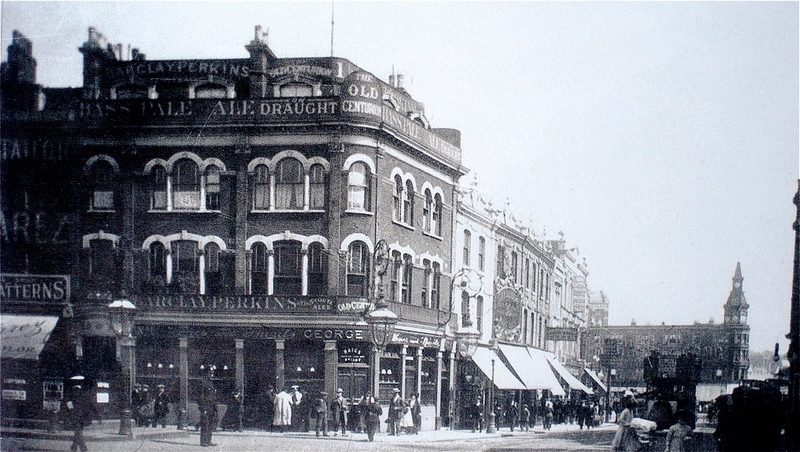 The Centurion Pub, Deptford High St.
Old photo of the Old Centurion Pub at the top of Deptford High St. Below ground toilets can be seen on the left and Deptford Broadway running away on the right. 1910? interesting to see these images. By comparison, Greenwich was a grubby little place. Thanks for posting this, fascinating to see how the Broadway used to look! My dad, Thomas William Foulds, born 1917, used to say there was an alcoholic doctor who used to sit in the "Cent" and sign blokes off sick in exchange for a drink. wow! i lived in room on top of the 'cent' for couple of years in late '90,s! got loadsa happy memorys in dat pub!! and the deptford arms! miss em days! My great grandfather married Charlotte Freeman who was one of The Old Centurion's barmaids in 1901. The landlord's name was George Miles (hence, I guess, the name George over the door in the picture), he was married to Rose and they had a daughter,, also called Charlotte. Aside from the Miles family there were six other live-in staff: four barmaids, a cook and a housekeeper. Sadly, Charlotte didn't last very long. She married my great-grandfather, Fred Anderson-Fortnam, in February 1912, but died in the same December. She would have been 34. Great picture I would like to think my Grandad drank in there as a young man after a hard days work in the docks.